A new study says the colors found in modern birds’ eggs did not evolve independently, as previously thought, but evolved instead from dinosaurs. According to researchers at Yale, the American Museum of Natural History, and the University of Bonn, birds inherited their egg color from non-avian dinosaur ancestors that laid eggs in fully or partially open nests. The researchers’ findings appear Oct. 31 in the online edition of the journal Nature. The egg colors of birds reflect characteristic preferences in nesting environments and brooding behaviors. 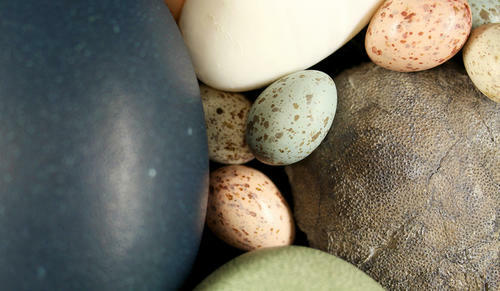 Modern birds use only two pigments, red and blue, to create all of the various egg colors, spots, and speckles. Wiemann and her colleagues analyzed 18 fossil dinosaur eggshell samples from around the world, using non-destructive laser microspectroscopy to test for the presence of the two eggshell pigments. They found them in eggshells belonging to Eumaniraptoran dinosaurs, which include small, carnivorous dinosaurs such as Velociraptor. The study’s other co-author is Tzu-Ruei Yang from the Steinmann Institute for Geology, Mineralogy, and Paleontology at the University of Bonn. Fossil dinosaur eggshells for the study came from the Yale Peabody Museum of Natural History, the American Museum of Natural History, the National Paleowonders Museum in Taiwan, the Steinmann Institute for Geology, Paleontology and Mineralogy in Bonn, and the Zoological Research Museum Koenig in Bonn. The research was supported by the Steven Cohen Award of the Society of Vertebrate Paleontology, the Macaulay Family Endowment, and the Division of Paleontology at the American Museum of Natural History.